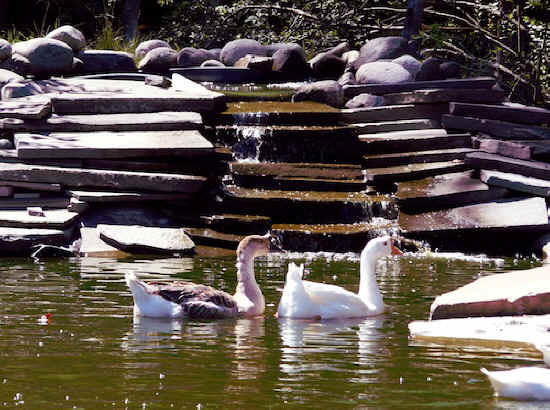 It was a beautiful sight in August, 2010, when Prema & Denise first took to our pond. A caring woman who worked at the farm inquired about them and was told that they had been dropped off by a man who could no longer take care of them over 10 years ago. Since then, they’d been cooped up with the chickens with no access to a body of water. 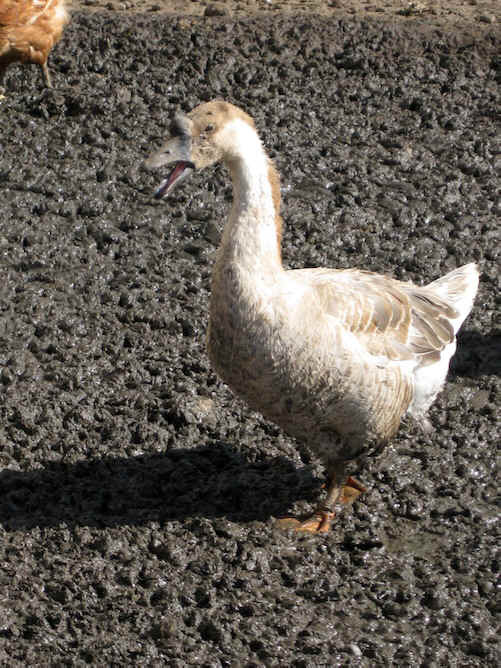 Ducks and geese need water to bathe and swim, this is necessary to keep them both happy and healthy. And one thing was evident at the farm where they were living: they were far from happy. Upon their arrival here at the sanctuary, we checked them out and gave them a good bathing in our infirmary’s tub sink. Both were caked with manure and mud and smelled awful. After their bath and other health checks we carried these two girls to the pond where our rescued ducks and 2 male geese live. Needless to say, both boy and girl geese were glad to have someone to flirt with! Denise and Prema swimming by the waterfall in our duck pond.